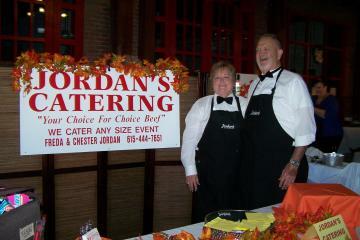 We are the Jordans and catering is our passion! Over 30 years ago, we decided to begin a catering business because of the joy we received while preparing dinners at our church on Wednesday nights. We first began out of our home, but have grown to now having our own catering building. Our Chef has over 30 years of experience and our Sous Chef has over 40 years of experience. Our employees work as needed and are always friendly and willing to help in any way. Our mission for every job we do is to provide you with the best service and food possible. We use the best USDA grade meats, and the freshest ingredients in each dish to ensure the highest quality for you and your guests at the most affordable cost possible.